So I had a real blat on accessories recently, which I have been taking photos of on a couple of models and slowly sorting/editing (as you may have seen as in the previous posts). Boy do I have a load of editing to do - but since I love it anyway I'm not going to complain.......anyway lets get to some of those finished images. This is really pretty in person, my camera hasn't picked up the sparkle very well unfortunately....but you get the idea. 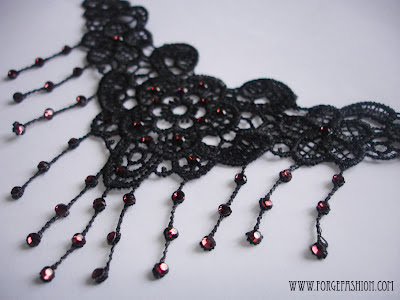 I have another lovely Swarovski Crystal piece with lace trim and fringe which is more 1920's looking (still on my editing list, but at least it's been photographed on a model....I'm making progress).